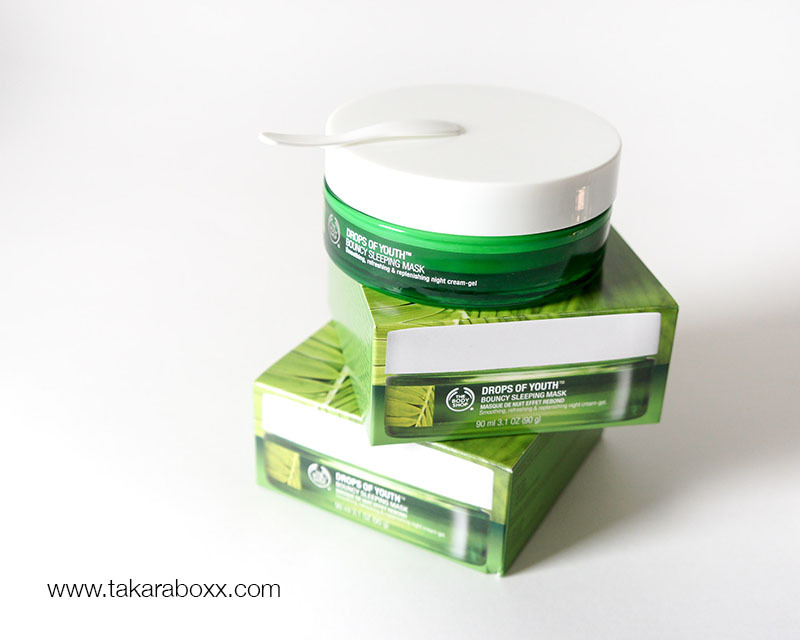 The bouncy sleeping mask is the newest addition to The Body Shop’s most adored line of products – Drops of Youth. You may recognize this line in-store with its own separate display and promotions stating a bottle of the original concentrate sells every few minutes across the globe. 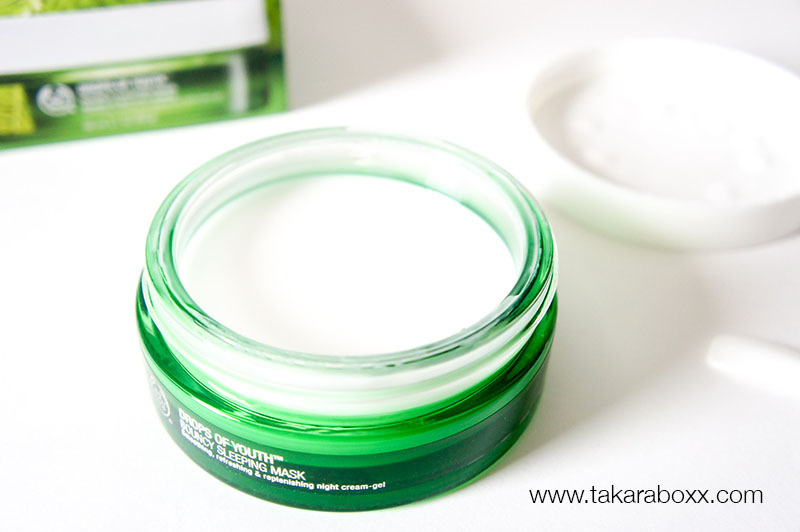 The concentrate is enriched with criste-marine plant stem cells whereas the bouncy sleeping mask includes Edelweiss stem cells. Edelweiss stem cells is a type of plant cell that is not only an antioxidant but also inhibits the breakdown of collagen. This gives the product the anti-aging property by maintaining the firmness of your skin. Let’s start with the packaging. Retailing for 30$ CAD, 90 ml or 3.1 oz of product is neatly packed in a heavyweight green-tinged container. The container itself has a nice weight to it which may be inconvenient for travelling but you can be sure it won’t break and spill. If I had to choose I’d much rather the extra weight from a good and sturdy packaging over a flimsy one that will break after just a few uses. 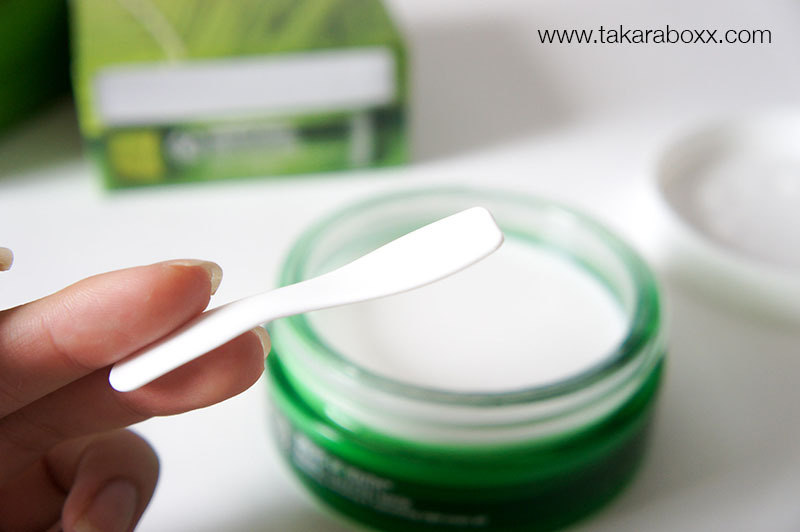 The white lid is the typical thin plastic lids from all other body shop body butters. When you open the lid you get a really muted but soothing scent that is perfect for night time. It’s not overwhelming but you will notice it when you apply it to your face. What gives this sleeping mask its trademark is definitely the unique texture which holds up to the “bouncy” in its name. The best I can explain….is…. imagine you’re taking a spoonful of pudding out of the cup. You’ll see a dent in the rest of the pudding but by the time you swallow the pudding (in this case, massage it onto your face), the dent will disappear. YOUR PRODUCT WILL LOOK UNTOUCHED. It’s like having an infinite supply! It’s between a cream and a liquid. It conforms to the shape of the container like a liquid but at a much slower rate. The Bouncy Sleeping Mask comes with a plastic cosmetic spatula which is ideal to reduce contamination. It also controls the exact amount needed to use all over the face. 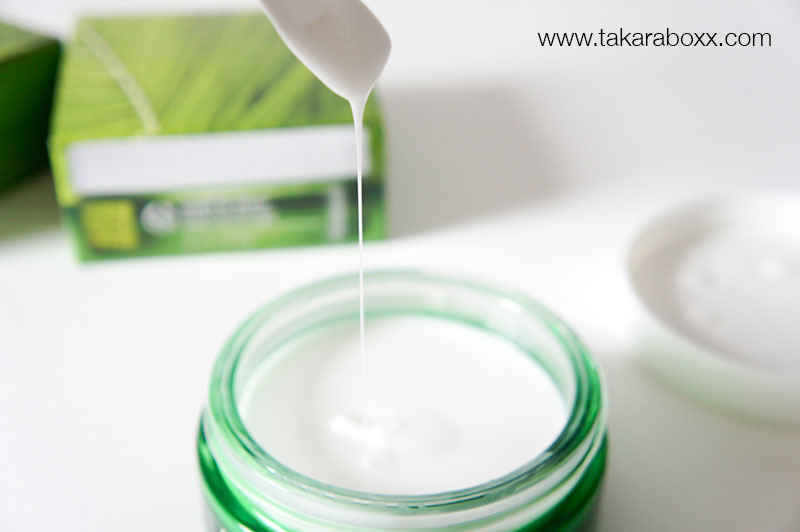 It is meant to be used as the last step of your skincare and left overnight to absorb into your skin. I take a spoonful with the spatula (it stays a cream until you touch it, which then it begins to melt from the heat) then I use my finger to transfer the product and put it on both my cheeks. I distribute the product to the rest of my face then massage for about 20 seconds then I leave it on. Using water I wash off the spatula and my hands then leave it to air dry. Like any overnight mask, you will notice traces of it still on your skin like a thin film of cream. I use water to wash it off then pat dry with a towel. 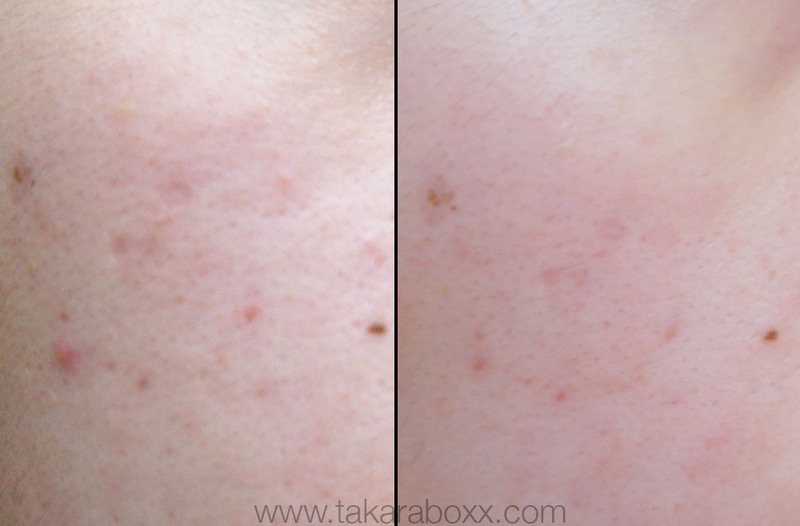 I noticed my skin being more supple, more hydrated and definitely smoother than it was. My skin is very sensitive and very dry and this product did not cause any breakouts or skin reactions. My skin has been improving steadily. Having a product that doesn’t aggravate your skin is really a big help because it prevents new breakouts and allows you to appreciate the changes even more. My skin still has hyperpigmentation and redness but the skin texture has definitely improved. I feel my foundation applying smoother in the mornings and my skin doesn’t feel like it’s trying to absorb every single product (foundation included) just for a little extra moisture – it’s satisfied. The Body Shop Bouncy Sleeping Mask Results after 3 weeks (Left = Before, Right = After). I’m still quite shy to post my skin because I’m not proud of it and still in the process of embracing it but hopefully this helps those out there who also suffer from the same skin concerns as I do. I definitely like this product and I can’t wait to see how my skin becomes in the longer run (will it keep improving? will it plateau?). In the meantime…. because I loved it so much….. I bought another! Something easy to use that will do what it claims to do and maintain itself in the long run. Has it met my expectations? Yes. Yes. and Yes. Have you tried this? What other The Body Shop products would you recommend? I’m so glad that you’re seeing results with the product and kudos to you for showing a photograph of its great results. I have so many masks I’m currently going through. Another one that I love is the sleeping mask by Boscia. Give that one a try. All their products are preservative free and contain jojoba and willow herb extract which is soothing towards the skin!